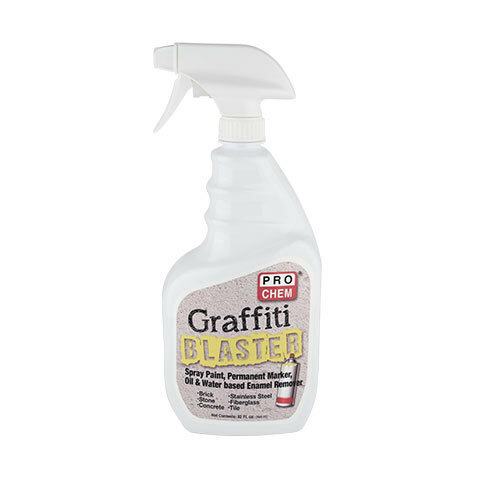 Graffiti Blaster | Pro Chem, Inc.
GRAFFITI BLASTER is a ready-to-use, water-based paint remover that safely breaks down the bond between paint and the surface. Effective on spray paint, permanent marker, acrylic, primer, lacquers, sealants and oil and water-based enamels. This ready-to-use formula can be used on both hard and carpeted surfaces to remove unwanted paint without the use of harsh chemicals and toxins. Shake well before using. Test on all surfaces in an inconspicuous area before using. If surface mars, dulls, discolors, fades or fiber color transfers to a white cloth, do not use. Test all plastics before using. 1. Apply to problem area and wait 3-5 minutes. 2. Use a brush to loosen dried paint. Use hose to rinse off, and wipe clean with a towel. 3. For porous problem areas, use a high pressure sprayer after Step 1. 1. Spray problem areas and wait for one minute. 2. Wipe with clean towel. DO NOT mix with bleach or use in conjunction with any household products.